that gets stunning results... very quickly! Every Marketer Secretly Loves to HATE! Everyone has their problems with copy. Yes, putting together copy is a major league hassle for the serious marketer who needs to get results. ...copy that PUTS MONEY IN YOUR BANK ACCOUNT? ...whatever communications you need to move your business forward? Well, that system is FAST EFFECTIVE COPY and it's powered by David Garfinkel's legendary Copywriting Templates™. ... but ads that have run in hundreds of markets, resulting in millions of dollars spent and many more millions in profits earned, across the decades. Certain words and phrases are fashionable. They float in and out of style. They might have tremendous impact this year... and next-to-none two years from now. ...they are so simple, so basic, so powerful and compelling... that they worked 100 years ago... they worked last year... they work now... and they'll work to make ads produce results until the end of time! Those are the words you will be guided to use with FAST EFFECTIVE COPY! 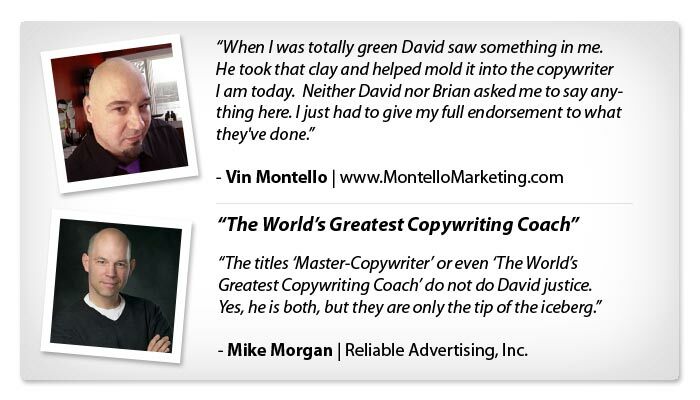 David Garfinkel's and Brian McLeod's Fast Effective Copy is much more than a typical copywriting course. Templates and step-by-step guidelines make it easy for you to come up with concepts and copy -- fast! Downloadable videos, audios and PDFs you can review and use anywhere — on your computer, on an airplane, even in the wilderness, on your phone! Simplified, tested and proven learning methods and copy toolssuccessfully used by thousands of people around the world! Everything is designed to save you time and get you results. If you just need a quick headline, you can hop on the site, pick a headline, adapt it to your offer, and know what to do next -- all in a matter of minutes. David has a long, strong track record of helping everyone from entrepreneurs who hate to write, to some of the world's other top copywriters and marketers. When you join Fast Effective Copy, you'll get results, too. 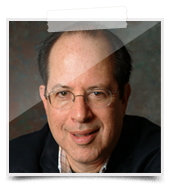 David Garfinkel is a top copywriter who's also known by many as "the world's greatest copywriting coach." He has dedicated his career to making it easy to write copy that sells for anyone who wants to (or needs to) write copy! It all started when he left a successful career in journalism, as San Francisco Bureau Chief for McGraw-Hill World News, in 1985. Since then, he has run his own business. He needed to learn copywriting over 20 years ago and was outraged by how difficult it was, even for him—an experienced, professional, award-winning writer. He set his mind to make it easier to write copy that closes sales — easier for himself, and for everyone else. His efforts prompted the world's best-selling marketing author, Jay Conrad Levinson, to persuade David to co-author Guerrilla Copywriting. 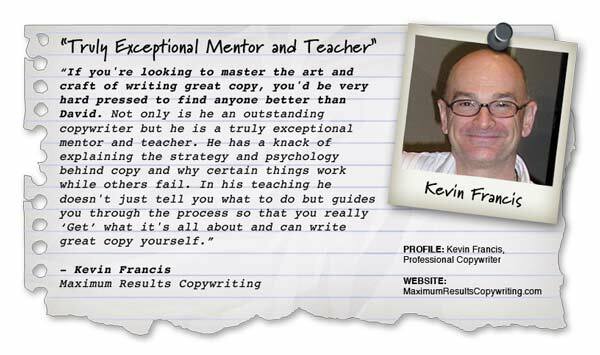 In 2000, David created the world's first online copywriting course, published by Mark Joyner's company at the time, Aesop Publishing. 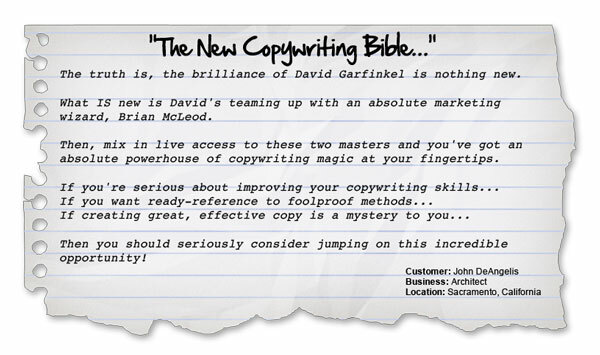 Since then, David has consistently been the innovation leader in teaching copywriting. 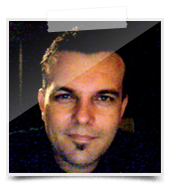 Brian McLeod is a 15-year veteran direct-response copywriter and creative marketing strategist based in sunny South Florida. Brian's unique talents in conceptual marketing strategy, world-class copy & design, and high-conversion sales video creation are sought out by both legendary and modern marketing masters alike... David Garfinkel, David Deutsch, John Carlton, Spike Humer, Yanik Silver, Ben Mack... just to name a few. In the mid-nineties, Brian co-founded of one of the nation's most successful new product development firms, launching that startup business from a spare bedroom and a paltry $10k in seed money into a 200+ employee corporate behemoth with a whopping NINE-FIGURES in sales revenue! 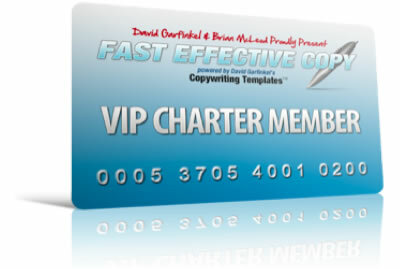 Brian is the only person who has been able to successfully take David's teaching and tools... and turn them into a powerful, easy-to-access (and highly affordable) membership site, Fast Effective Copy. Brian appears with David as co-host to our monthly in-depth teleseminars for Fast Effective Copy members only — an exclusive feature of this site! When David first sent Brian a copy of Copywriting Templates™ he assumed Brian realized what a MASSIVE package it was. "You know what, Jedi? I LOVE this training... it's absolutely amazing - but I'm also a little overwhelmed by all of this - and I'd be willing to bet that if I feel that way, I'm not the only one..."
He continued, "This course is like a gold-filled treasure trove and half the time I open it up - I just pick a section and start there, figuring its what I'm meant to read at that moment... and damn if it doesn't work just like that! All the same - would you be open to a new way of thinking about and delivering this training program to people?" David replied chuckling, "Sure, but you know you wouldn't be the first to try..."
Brian grinned - because he knew EXACTLY what to do to make Copywriting Templates™ the most useful, results-oriented copywriting resource available anywhere, at any price - it was just going to require more work than most sane folks were willing to consider. Fast Effective Copy was born... and the results speak for themselves. 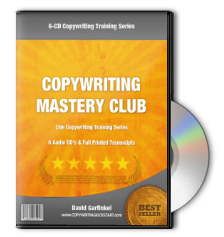 For years now, David Garfinkel's seminal Copywriting Templates™ training course has been praised by the highest-paid, highest-skilled copywriters in the business. Almost every well-known copywriter owns the course - and many have been known to show off their dog-eared copy of the templates as proof of how much they rely on it. The real genius of David's Copywriting Templates™ is that it's a copywriting master-class embedded inside a shortcut system. Sure, David shows you how to cut your writing time in half, and double your profits as a result... but inside this training, David's legendary skills as a one-of-a-kind teacher really shine. Copywriting Templates™ gives you what you WANT - speed, efficiency, a running start... but also sneaks in what you NEED - deeply persuasive buying psychology and the proven structures of winning copy. So, naturally - this course has always been in demand. And You Can't Have It..."
The $1,200 physical version of Copywriting Templates™ lands on a customer's doorstep with three two and a half inch 3-ring binders jam-packed with transcripts and printed materials. It comes with a separate printed and bound book. It comes with around two-dozen audio CD's and DVD's. And David is famous for taking Copywriting Templates™ off the market - often the only way someone could obtain it was to participate in David's high-end mentoring/coaching, which is a $25k per year proposition! Every once in a while, David would make the program available as part of a promotion for a partner. But even when he offered those fleeting opportunities to grab it at a discount, the cost was usually around $800-$1,000. To make a long story short, Copywriting Templates™ is famously valuable and not that easy to get your hands on - especially without spending a boatload of money. That's what makes being a member of Fast Effective Copy such a rare opportunity, and such an amazing value for any profit driven marketer. We worked hard to make this easy for you! 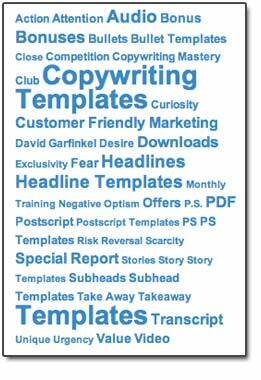 You get immediate unrestricted access to David's entire Copywriting Templates™ course. We've completely updated and revamped all of the materials and wrapped an incredibly useful membership site around them - giving you a whole new level of value and usefulness from Copywriting Templates™. You might say that this is what Copywriting Templates™ was always meant to be... technology just had to catch up first. You get all 12 of the freshly updated modules - all the templates - all the audio training - all the transcripts - EVERYTHING is available to you instantly as downloadable MP4 Video, MP3 audio and PDF documents. PLUS, you always have 24/7 "Anytime Access" to everything online inside your private Member's Account. You can have Fast Effective Copy open and ready for you at a moment's notice, with a click of your mouse. No more hunting and digging for the right CD or searching your hard drive for the download files! You'll want to pour yourself a nice glass of your favorite drink and take a little time to kick back... explore the site. Get to know all the neat little features we included for you. Many of them will save you time and make things easier for you right away. ...and tap into the key psychological triggers that compel prospects to pay attention, get excited and BUY LIKE CRAZY... whatever your market may be and whatever the product or service you sell. Let's say you want to "punch it up" and make it even more engaging... and more profitable. You can easily do that in minutes with Fast Effective Copy. Copywriting Templates™ gives you the exact steps to add intensity and appeal to your headline… bullets… subheads… P.S.… stories… offer… even your guarantee! And they're all spelled out, in easy-to-follow checklists, on individual pages of the PDF. Since in copy very often it's the little things that count, this tool alone can make a HUGE difference for you. In response. In conversion. In sales. In PROFITS! And yet, what we've shown you is only a sample of what you can do. 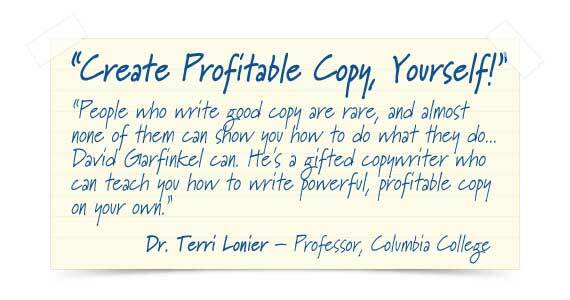 The more you use Fast Effective Copy, the more you will discover… and the more you will profit from it! 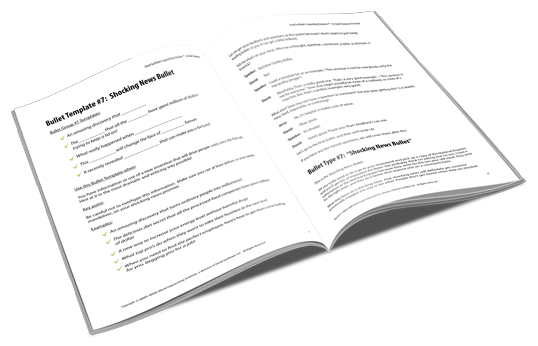 Wherever you've got web access, you can use the new, improved online version of David's best-selling Copywriting Templates™ inside FastEffectiveCopy.com! You get examples for how to use the templates, a one hour recorded class in streaming, downloadable and PDF transcript form. View online or download beautifully designed PDFs to read onscreen, search or print out. Effectively communicate the tremendous value your offer represents - and make your reader desperately want it! "Anytime Access" to the templates inside the members area. You get instant access to two Bonus Quickstart Audios that ensure you get the most out of your membership at Fast Effective Copy. Quickstart Audio1 is an orientation and overview session. Quickstart Audio 2 is teaches you how to source products from the public domain you can use for "profitable practice". Each comes complete with Enhanced PDF Transcript for easy reading and reference. 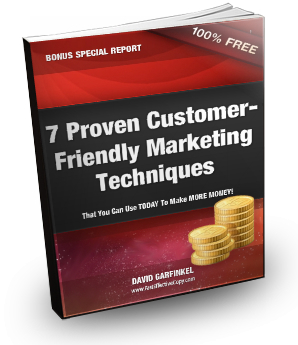 You get David's exclusive Special Report, "7 Customer-Friendly Marketing Techniques You Can Use TODAY To Make More Money". Discover how to add selling power to your copy without using testimonials or affiliate endorsements. You get 7 new techniques to supercharge the selling power of your copy along with 7 templates that allow you to instantly use each technique. You can download Customer Friendly Marketing as a PDF or conveniently use the templates inside the members area with "Anytime Access". You get "Your Personal Energy" with David Garfinkel and Dr. Dave Woynarowski. This special one-hour audio training session that will help you better manage your creative and personal energy for maximum productivity and reduced stress. We all do our best work when we feel good, feel motivated and feel powerful. While this bonus is not specifically about copy, it is absolutely essential for being able to reliably deliver your best creative work - you're going to love it. Also instantly available: 21 “Recipe Videos” and “Cheat Sheets” to guide you through almost any conceivable kind of copy. We'll cover the latest marketing tactics and interview other top marketers on laser-focused topics that give you a powerful and lasting edge in the marketplace. You get the complete replay recording of each event - including the PDF slides from the presentation, an MP3 Audio version of the recording, and an enhanced PDF transcript of everything. You'll always have a complete archive of each exclusive training session from Fast Effective Copy. ...you always get the full benefit and value of your membership. What kind of copywriting offer would this be if we didn't make you an absolutely irresistible offer? Although Copywriting Templates™ alone has sold for $1,200 for years, you're not going to pay anywhere near that much. When you say "Yes!" TODAY, you get in with one easy payment of only $497! Then you'll have lifetime access to the Templates and all the free bonuses. No matter when or how much we raise the price in the future (and we WILL be raising the price without further notice) you will never pay a penny more ever again, and you will have ongoing access to live monthly trainings from two of the highest-paid, most revered marketing minds in the game for as long as we continue to do them. Which we plan to do for a long time to come! 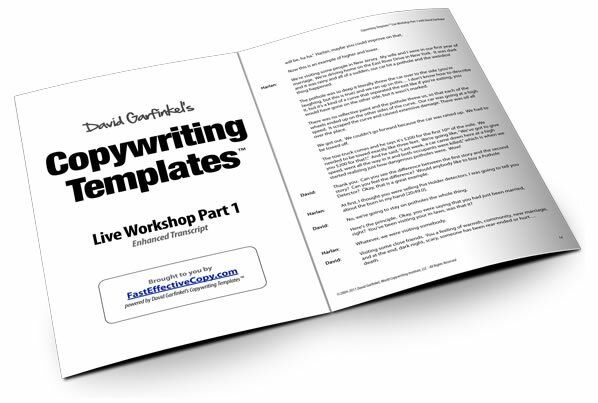 Not only do you get the complete Copywriting Templates™ course inside Fast Effective Copy, you get access to special bonuses worth thousands - absolutely FREE! 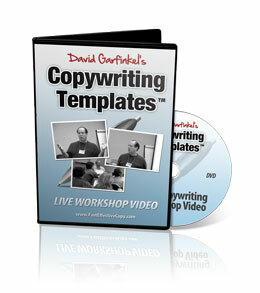 You get a very valuable, exclusive video: The Live Copywriting Workshop - a complete video recording of David delivering his Copywriting Templates™ training to a room full of marketers who paid $5,000 a head to be there. We've digitized 2 DVD's worth of high quality vdeo recordings and made them available as streaming and downloadable MP4's (they're big whoppers, too - we wanted to maintain the highest quality of the DVD video for you). Downloadable Powerpoint Slide PDF with 10 easy, step by step ways to create copy faster and more effectively. It's David's presentation during the workshop, so you can follow along as if you were right there in the room! It's an amazing bonus - and it's sure to help you use Copywriting Templates™ more effectively - and it's our gift to you as part of your Platinum Membership. "But Wait... There's Even MORE..."
That’s right. 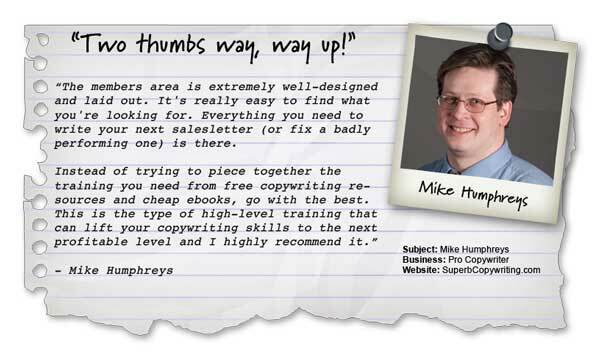 In addition to the treasure trove of copywriting materials we’ve already mentioned, you ALSO get access to 6 high-powered sessions from The Copywriting Mastery Club - a six-month in-depth copywriting master class with handy how-to shortcuts built into each session. Along with David, you'll hear from Vin Montello, Mike Morgan, Chris Haddad, Harlan Kilstein, Ben Mack and others. 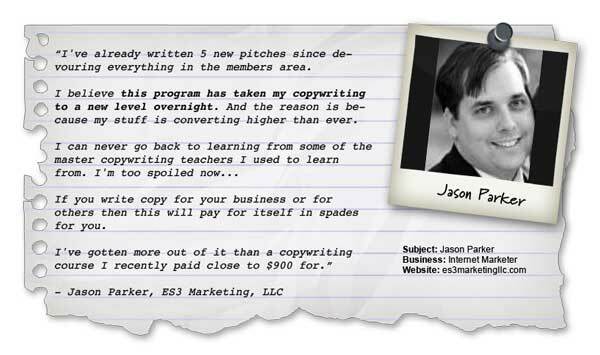 For just one payment of $497, you get the complete Copywriting Templates™ training course and materials... and you'll become a Platinum Member forever. Plus, you get the Live Copywriting Workshop … and the Copywriting Mastery Club bonuses… 21 Recipe Videos and 21 “Cheat Sheets”… instant access to past sessions of our Monthly Training Webinars… plus, complete access to live sessions and recordings of our ongoing monthly trainings. 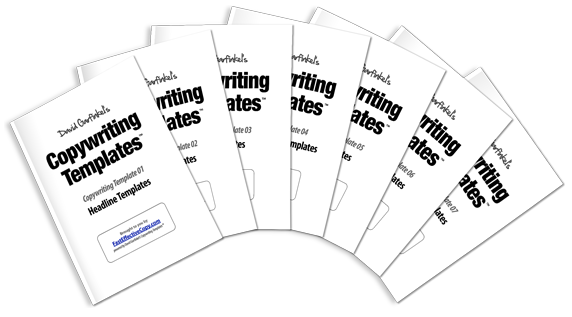 This is thousands and thousands of dollars’ worth of uniquely effective copywriting training materials… for a one-time $497 payment that grants you lifetime access. "Wow - have you guys gone nuts?" Some of you may be asking yourself why in the world would we offer such a stunning amount of training, support and proven money making expertise for such a low price. We have an active recruiting goal in place - we want to put thousands of new members into this system as quickly as possible. So, that means you're getting a $1,200 copywriting toolkit and master class for roughly 75% off - along with thousands of dollars worth of additional bonuses absolutely free. 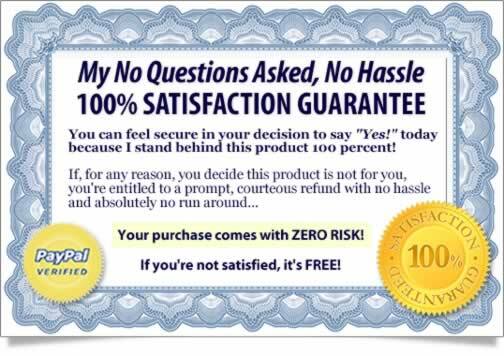 Your $497 investment is guaranteed for 60 days from the day you make your payment. If you don't find this changes your life and the value you received far exceeds the nominal investment, just ask for your money back, and you'll get it. We're confident in offering that guarantee because we know from history how satisfied people have been with Copywriting Templates™ — and how Fast Effective Copy is even quicker and more valuable to use than the product it is based on. Bottom line: You are fully protected. You have nothing to lose — and everything to gain! In mere moments from now, you will have instant access to the same copy training that virtually every star-studded celebrity copywriter owns and uses. And you'll have it in a completely new, modern and fully updated format that makes it faster and easier to use than ever before. It's an easy decision: Try Fast Effective Copy at no risk whatsoever. Sign up today for one easy payment of only $497. Take your time exploring the site (after all, you've got a full 60-day money-back guarantee). Use the tools whenever you need to put some copy together. 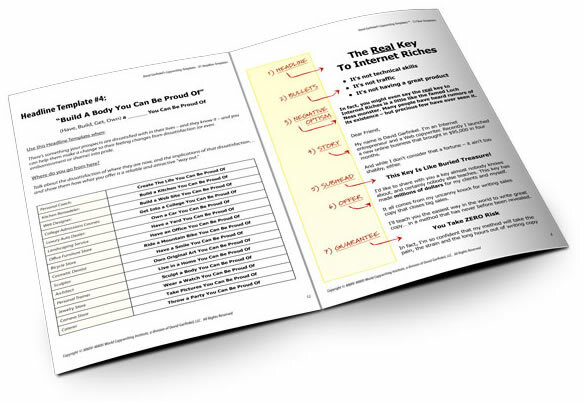 Learn shortcuts and inside secrets that take you to the next level. Notice how much easier it is, how much faster things go, how much better your results turn out. Just click on the link below to get instant access! Your Problems With Copy -- Forever! P.S. If this deal seems too good to be true, it may be... as you look back on this only a few short weeks or months from now. We're in the midst of a massive recruitment drive. We want to see thousands of new members using and enjoying the benefits and financial rewards made possible by joining Fast Effective Copy. After we reach our initial recruitment goals, the price will likely jump significantly. So don't delay. You are being presented with a tremendous opportunity and a great value! But your low one-time investment is available today for only $497, as long as you get in while this Web page is up.